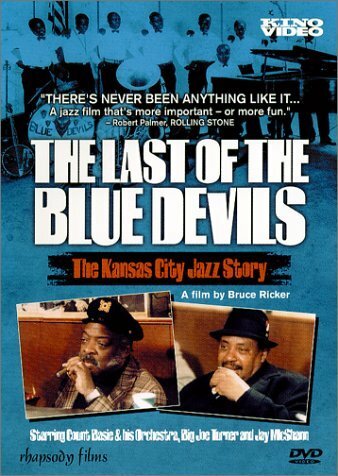 Director Bruce Ricker's 90-minute The Last of the Blue Devils chronicles the 1979 reunion of many of these legendary players, combining interviews, vintage film footage, photos, and some inimitably swinging performances by Basie, Turner, pianist Jay McShann, and many others to create an intimate, good- natured portrait of what one old-timer calls the cool, relaxed sound of the city. The camaraderie among these men, all of whom are colorful raconteurs (drummer Ernie William's harangues to some bemused local kids are especially entertaining), is palpable. But it's the music, unsurprisingly, that's the main attraction; performances include some familiar tunes, like Turner's Shake, Rattle & Roll and a Basie big band version of Night Train (featuring tenor saxophonist Jimmy Forrest, the tune's composer) that's as greasy as the local barbecue. The Last of the Blue Devils is an absolute delight.